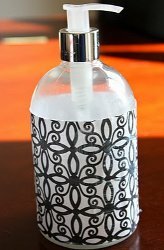 If you're tired of looking at the same old soap pump and are looking for a replacement soap pump, check out this Mod Podge Soap Pump Tutorial from Victoria Lavertu, which will show you how to create cheerful liquid soap dispenser pumps, perfect for a bathroom pump soap dispenser. Measure to see how much of the pump you want covered. Measure up to where the sticker goes, and measure around it. Cut your piece of paper to the measured size. Pull out your Mod Podge and apply it to where you need covered. Carefully place your paper onto the soap pump on the appropriate spot. Smooth the paper as well as you can. Apply the Mod Podge over the paper. Let dry and reapply another coat. Once it's dry, you can embellish as you wish. For the ribbon, line it up along the top and the bottom, and hot glue it on. Oh my why did I not think of this. I mod podge a lot of things and never thought to mod podge some of the soap pumps I have. I reuse them but I want to get what was in it before off. Using scrapbook paper is a brillent idea. I want to give hand soap as gifts and this will be a good idea. What can you put on top to make sure it does not peel off? Very inventive! But wouldn't it slough off the bottle if it gets wet or soaked in water? Nevertheless, this is actually a good idea, not only with your soap pump. You can also use soda bottles and apply mod podge into it. Decorate it in your room or bathroom. Won't this get ruined if it gets wet? Where is the ribbon you are referring to in #8?